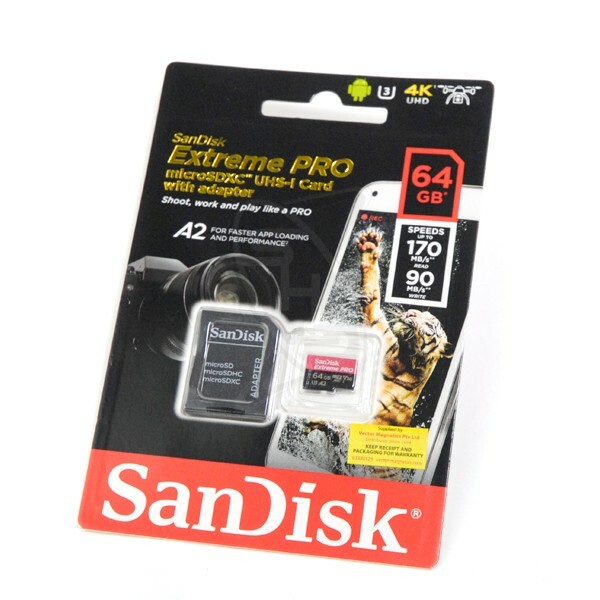 SanDisk Extreme PRO microSDHC/microSDXC UHS-I memory cards now come with up to 128GB1 of storage for uncompromising smartphone, tablet and camera performance. Capture 4K Ultra HD and Full HD videos2 and enjoy transfer speeds of up to 100MB/s3 so you can shoot like a pro and still experience world-class responsiveness from your phone. Class 10, UHS-I Speed Class 3 (U3) and Video Speed Class 30 (V30)4 ratings mean your videos can meet today's highest resolution standards. • For AndroidTM smartphones and tablets and interchangeable-lens cameras. • Records 4K UHD and Full HD video2. • A1-rated for faster app performance2. • Shock-, temperature-, water-, and X-ray proof5. SanDisk Extreme PRO microSD™ UHS-I cards transform the way you experience your mobile device with read speeds of up to 100MB/s3 for advanced photo capture and faster file transfer. Pro video performance with both UHS Speed Class 3 (U3) and Video Speed Class 30 (V30)4 ratings lets you capture 4K Ultra HD and Full HD video2. Your videos will meet today’s highest resolution standards and will look stunning on the latest 4K Ultra HD TV screens and monitors, making this the ideal card for your 4K Ultra HD video-enabled smartphone, tablet or camera. Generous storage capacities up to 128GB1 mean you won’t run out of the memory you need to work, shoot and share high resolution videos and stills. Rated A1, the SanDisk Extreme® PRO microSD card is optimized for apps, delivering faster app launch and performance, which provides a better smartphone experience. SanDisk Extreme PRO microSD UHS-I Cards5 are waterproof, shockproof, x-ray proof, and temperature proof to protect your memories from life's mishaps. Take your phone or tablet to the snow, to the pool, or to the desert. You card will survive, even if your device doesn't. The card comes with a RescuePRO® Deluxe data recovery software download offer6. This software makes it easy to recover files that have been accidentally deleted (download required). Capture 4K Ultra HD and Full HD videos and enjoy transfer speeds of up to 100MB/s so you can shoot like a pro and still experience world-class responsiveness from your phone.